I've plotted Merer's comings and goings onto a chart. I have noted where it is stated down or upriver. Otherwise the papyri state "towards". When a direction is not given it is deduced by the "sailed from" and where he "spent the night". Note the legend at the top of the page. "X" is where he spent the night. Merer's name is not given. No purpose is given for the sailing trips, no goods are mentioned, nothing is loaded or hauled. It is simply - went here, went there. Day 10 : he moors at Akhet Khufu. As Thanos pointed out, he didn't "moor" at the pyramid. days 6, 7 & 8; although he sails "towards" Akhet Khufu he seems not to reach this destination spending each night in Ro-She. There is no return trip from Akhet Khufu. On day 7 he sails towards Akhet Khufu and Tura North at the same time, even though they are two separate locations. Some see these 3 days as loads being taken to the pyramid. But it is not stated that the ship arrived at A-K, it states arrival at Ro-She only. AI is written in the first person. From AII on it's third person. There are at least two scribes involved. A handwriting analysis done by a neutral party, not an Egyptologist, might confirm the change in writing style was the result of different scribes. She-Khufu is not mentioned in connection with Tura North. Ro-She is not mentioned in connection with Tura South. AI & AII & BI don't mention Ro-She. There were two, maybe three different routes. One may be have been circular or triangular. Merer was an "inspector" but he doesn't inspect anything. There is absolutely no mention of quantity or quality of any goods whatsoever. There is only one day, day 4, that a quantity of goods is given. The director of 6 assumedly returns from Heliopolis with food supplies. But the day before this Merer had set sail towards A-K and wouldn't have known of director 6's return. Since nothing was inspected, I'd have to say the title "inspector" is a mistranslation. Merer spent a total of 13 days hauling or loading stone and 9 days working on the dike. Merer was a laborer. It is important to note that for the most part the log states sailing "towards" A-K and does not put Merer AT A-K. There are only 2 days where Merer is said to actually arrive at A-K. And as Ori keeps saying, there is only 1 day in which a load of stones arrives. 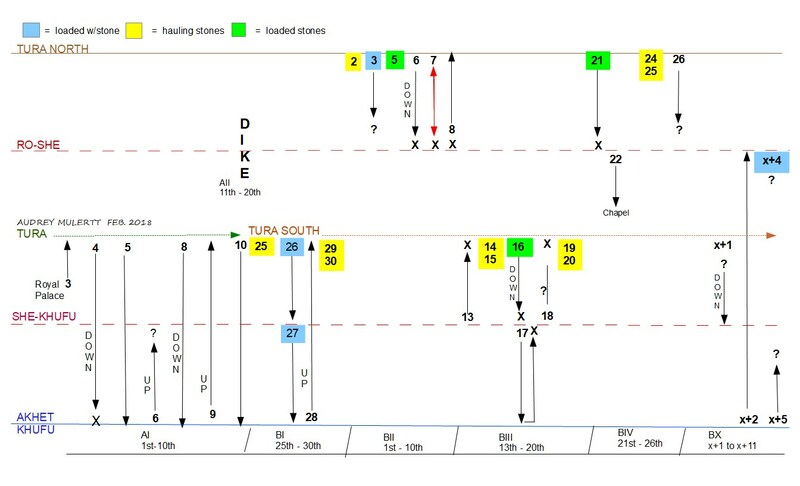 It might be assumed that on day 16 having loaded a ship, the ship arrived with the load on day 17, which is a round trip day; She-Khufu >> A-K and back with no mention of stone let alone unloading. Or it might be assumed the stone was unloaded at She-Khufu as that is where they stay the night. These papyri are not a diary or logbook, they are timecards. A true logbook would list cargo, when and where it was delivered. Some of you like to evoke Occam's Razor. The simplest explanation with the least amount of assumption is that Merer was stationed at al-Jarf where the papyri were found and he sailed the Wadi or the Red Sea He sheltered at the galleries, hence the find of charred wood, charred scribe painting and I think charred jars (fires for cooking and light). The entrances were later covered by sand and rocks, deposited by the wadi. The stones were for the construction of the building and wharf at al-Jarf. A few pieces of wood does not a storage facility make. Thousands of crushed jar fragments does not a sealed chamber make. Only far fetched assumptions make it so. The number of assumptions made by Tallet & Marouard is astounding. Tallet is dreaming, he sees what he wants to see, not what the papyri say. Mark my words, the next step will be Egyptologists finding "variants" of Ro-She and She Khufu. They need variants because the two locations are not mentioned elsewhere. They will invent new rules for these variants, all of which will be based on the AE religion. They will do this as final proof linking the Great Pyramid to the papyri, the nail in the coffin, the icing on the cake that dispels all objections.